Kenny Shiels spoke of his delight at Kilmarnock's capture of Kris Boyd after his side drew 1-1 with Aberdeen. The 29-year-old striker watched on from the stands at Rugby Park and hopes to feature against Hibernian on Wednesday. Boyd left Portland Timbers in January and is the Scottish Premier League's all-time top scorer with 164 goals across spells at Killie and Rangers. 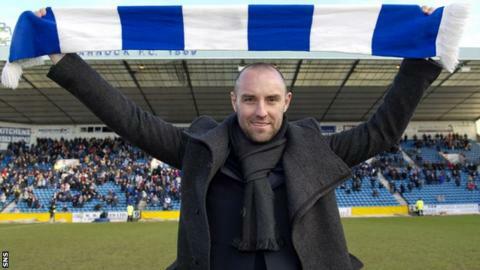 "I'm absolutely delighted to get him on board, his record speaks for itself," manager Shiels told BBC Scotland. However, the Killie boss was a little irked that many of Saturday's newspapers had chosen to display Boyd in a Rangers strip on their back pages. "I'm a little bit disappointed with the press," said Shiels. "They couldn't make the effort to get him in a Kilmarnock strip. "He played a lot of games for Kilmarnock and it was a bit insensitive in the current climate to put him on the back page with a Rangers shirt on." Aberdeen dominated the opening exchanges of Saturday's encounter and went ahead through a classy Rory Fallon half-volley. Niall McGinn hit the post soon after and wasted further opportunities, allowing Paul Heffernan to level before half-time. Shiels said: "They started better than us and got themselves in front, but then we dominated the patterns. "We had a good grip on the game and I thought - this is going our way, but it upset our rhythm when we lost [Borja] Perez and after that I thought our defence became very indecisive." With 15 minutes remaining Kilmarnock keeper Cammy Bell appeared to foul McGinn in the penalty area. But referee Euan Norris instead booked the Northen Irishman for simulation. "I'm trying very hard to discipline myself not to speak about referees," Shiels said. "I'm not allowed to speak about referees and I'm not allowed to speak about other teams because they'll fall out with me."